Michigan’s week in Florida manages to get under everyone’s skin while spreading the Wolverine gospel in SEC country. The great spring break troll of 2016 is over. Finis. Jim Harbaugh and the Michigan Wolverines came to Florida and conquered the world of college football without firing an unnecessary quip. All is well with the world. Right? Not exactly. 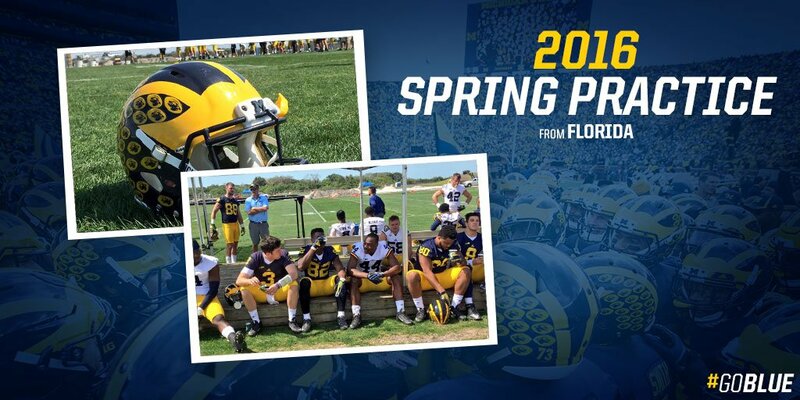 Michigan’s ability to set up camp for a week at IMG Academy in Florida, a private school loaded with FBS-ready talent, was a stroke of genius. Once again, Harbaugh found a way to push the edge without coming close to breaking a rule, garnering breathless attention in his wake. Most of the complaints came from the Southeastern Conference. The league is the established king of recruiting because of a geographical advantage, big money and a sign-a-Top-10-class-or-else mandate to coaches. Yet Harbaugh came into the heart of the SEC’s talent pipeline, proved his point and spread the Wolverine gospel to anyone with a willing ear. He’s not done. He also announced a new set of satellite coaching camps for the summer, including an appearance at Bob Jones High School in Huntsville, Alabama. That’s just over two hours from the campus of reining national champion Alabama. The date for the Huntsville camp? June 6. Yes, D-Day. The Michigan invasion has begun. There are reasons to complain. For one, no one else has managed to take spring practice to a fertile recruiting site before. For another, the SEC is using the argument that Michigan’s spring break isn’t fair to student-athletes. Rules govern how much time you can take from the life of a college football player – and for good reason. Harbaugh retorted that Michigan adhered to the 20-hour-rule. And with two NCAA enforcement reps on hand, to make sure the Wolverines didn’t cross the line, no rules were broken. The point of the rule, however, is to let athletes be students. They already give up Thanksgiving, Christmas and New Year’s holidays in pursuit of postseason dreams. It will be up to the NCAA to determine whether spring break as a team is an infringement of personal liberties, a benefit or a non-factor. Oddly, while the SEC has leveled its share of complaints, the reaction from the Big Ten has mostly been silent. If the NCAA doesn’t change the rule on off-campus spring breaks, the SEC will merely follow suit. Imagine LSU setting up camp near a prospect-laden school in Southern California. Or Alabama jetting off to Hawaii to turn a dull spring week into a palm tree paradise. The SEC has the money and access to talent already. But in the Big Ten, where population shifts and recruiting hotbeds are shrinking, the rest of the league has more to lose. At least that was the Old Word view, before Harbaugh arrived in Ann Arbor. It’s now Jim Harbaugh’s world. We’re just breathing his air. Editor’s note: Morning Ticker welcomes Doug Segrest as a new Featured Author. Segrest is a veteran sports writer who primarily covered college sports and professional baseball at The Nashville Banner and The Birmingham News, where he was named Tennessee and Alabama Sports Writer of the Year. He’s also the co-host of the highly rated “The Zone” talk show. Harbaugh is all sizzle so far. He’s getting under everyone’s skin for sure but wait until he accomplishes something on the field to say he’s winning. I’m an TOSU fan, and like my Buckeye brethren I’m not worried.